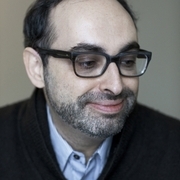 Saratoga: Gary Shteyngart "Little Failure"
Tickets are now sold out, for this event presented in partnership with the New York Library Association! A limited number may be available at the door the night of the event. This event is a reading, book signing and reception with the author. Tickets are $45.00, and include the event, light refreshments, and a paperback copy of "Little failure." Tickets are now sold out. This event will take place at the Saratoga Springs Public Library, 49 Henry Street. Gary Shteyngart was born in Leningrad in 1972 and came to the United States seven years later. He is the author of the novels Super Sad True Love Story, which won the Bollinger Everyman Wodehouse Prize and was selected as one of the best books of the year by more than forty news journals and magazines around the world;Absurdistan, which was chosen as one of the ten best books of the year by The New York Times Book Reviewand Time magazine; and The Russian Debutante’s Handbook, winner of the Stephen Crane Award for First Fiction and the National Jewish Book Award for Fiction. Displaying results 1-5 of 5 titles for "Gary Shteyngart"
Gary Shteyngart's book Little Failure was available from LibraryThing Early Reviewers. Gary Shteyngart is currently considered a "single author." If one or more works are by a distinct, homonymous authors, go ahead and split the author. Gary Shteyngart is composed of 9 names. You can examine and separate out names.